A Poetry Pole is a small wooden or plastic box perched on, obviously, a pole, usually situated at the sidewalk edge of someone’s front lawn. 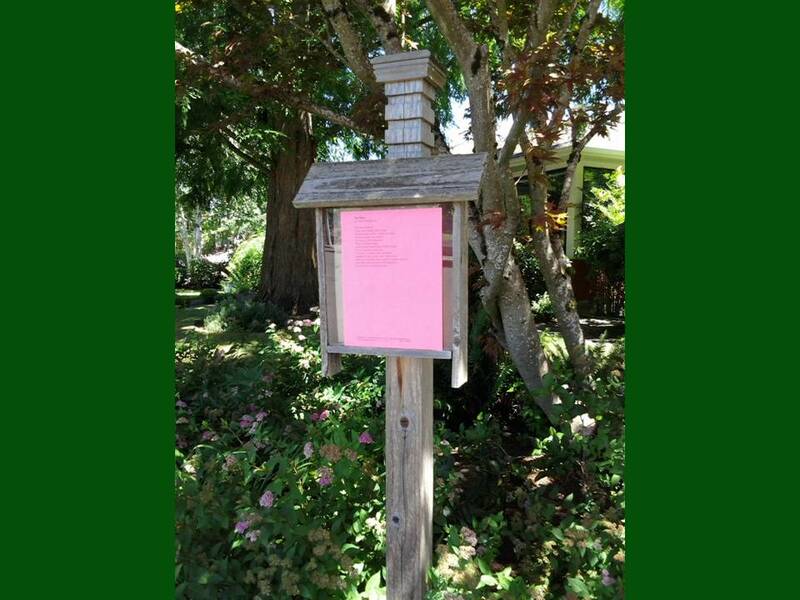 The box holds several copies of some poem, thoughtfully chosen by the Keeper of the Poetry Pole. Passersby can read the poem and continue on their way. If you enjoy the poem, you can usually take an extra copy for yourself, unless others have come before you and depleted the stash. Poetry Poles are scattered throughout Portland. Fortunately, my neighborhood has more than its fair share. I’d forgotten I loved poetry until my new walking route started intersecting with several Poetry Poles. I’ve never enjoyed sitting down and reading an entire book of poems. Too overwhelming. However, give me one sweet, edgy, delicious, decadent, moving, or thought-provoking poem and my spirit can soar for hours, even days. I think of Poetry Pole Keepers with the same awe and appreciation I ascribe to lighthouse keepers . My favorite Poetry Pole Keeper is Martin, whose choice of poems fills my soul, reinvigorates me on difficult days, and reminds me of what is important in life. He has introduced me to poets I had never heard of before like Max Reif, Joyce Sutphen, John O’Donohugh and Naomi Shihab Nye. He has helped me pause on days when I am so wrapped up in problems, challenges or deadlines that I almost forget to breathe. In front of his Poetry Pole, I stop, I breathe, I feel, I think. Then I go on my way and complete my walking circuit. On his website, SightingsPhotography.com, Martin quotes his friend, Ben Thompson, as having said, “When the sense of poetry is gone, the ballgame’s over.” I concur. Thank you for helping me keep the wonder of poetry alive inside me. What I love about Poetry Poles goes way beyond the words on the pages tucked inside the wooden boxes. People have found an unexpected way to give a gift, share something important with others — not just friends, relatives and colleagues — but also complete strangers with whom they share community. Especially in these challenging times, I consider that a daring act of creativity and kindness.